Assistant Secretary Anmarie Aylward, Community Corrections Specialist Nick Weber and Secretary Bernie Warner. Community Corrections Specialist Nick Weber figured there might be trouble when he rounded a corner at Forest Ridge Park and spotted a violent suspect wanted for stealing firearms sitting in a Chevy Blazer with his girlfriend. The girlfriend hit the gas pedal as soon they spotted Weber and, after driving over the hood of another specialist’s car, slammed their SUV head-on into his vehicle. Weber was seriously injured, with cuts, a broken nose and a concussion. Losing consciousness, he still managed to fire his pistol at the suspect in an effort to prevent the couple from causing more harm. The suspects were caught, arrested and put behind bars. The U.S. 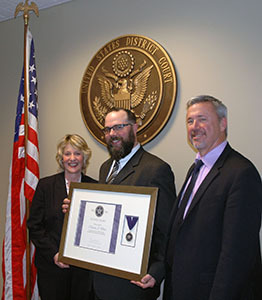 Marshals Service recently awarded Weber a Purple Heart for the injuries he received while helping capture Nelson at the park outside Bremerton almost one year ago. Weber, a 14-year veteran with the state Department of Corrections, ended up in a hospital and went through months of rehabilitation to recover from his injuries. Although he’s been involved in similar incidents before, and been injured, Weber says he never considered getting into a different career. "It’s part of the job," said Weber, 37. "The potential for this to happen is there any day." David Miller, acting U.S. Marshal for the Western District of Washington state, said they waited a year to award the Purple Heart because they wanted Weber to recover from his injuries first. "So many people who receive the Purple Heart don’t recover from their injuries or aren’t here to receive their award," he said. "We’re very lucky that Nick has fully recovered from his injuries. It could have been much, much worse." Weber is one of 30 specialists whose job is to track down hard-to-find violent inmates before they can cause harm. They work in specially trained Department of Corrections Community Response Units (CRU). The CRUs are part of the larger Community Corrections Division, which has more than 650 officers statewide supervising roughly 17,000 inmates. Weber and the other specialists partner with law enforcement agencies throughout the state to keep dangerous inmates off the street. Each specialist serves on a federal, county or municipal task force, as part of an interagency agreement. Weber works with the U.S. Marshals Service’s Pacific Northwest Violent inmate Task Force. "We’re on target to arrest 800 people this year," said Ray Fleck, acting assistant chief of the Marshals Service’s Western District. "That means two to three times a day, officers are putting themselves in harm’s way." Overall, the DOC specialists’ work runs the gamut, from encounters like Weber’s to helping track down inmates in other states, to long-term operations, lasting months or years, that result in multiple arrests and seizure of large amounts of illegal drugs, weapons and cash. The pay-off for Washington residents is less crime occurring in their neighborhoods. "The work is not mentioned often," said East CRU supervisor Brent Martin. "However, it is clearly appreciated in the big picture of disrupting and dismantling large-scale operations that supply and destroy communities." A lot of what Weber and the other Specialists do is out of the public eye and has an air of mystery about it – with good reason. The specialists’ work is under cover, conducting investigations on highly volatile inmates that necessitate a low profile. "There’s the impression that we’re bigger than we are because of the type of work we do, but we’re not," Weber said. "We’re a small group, which has advantages and disadvantages. We can certainly move faster than a larger group in some situations." Weber started as a community corrections officer in West Seattle in 2001 and has been actively involved in firearms training for a number of years. He was also instrumental in the development of the Community Corrections Division’s Arrest Planning Implementation (API) training. In fact, at the time of the Bremerton incident, Weber was scheduled to travel to Spokane to train API trainers as soon as the arrest process was completed. His supervisor, Mike Poston, commented that Weber "is very good at what he does." He should know. Poston was driving the silver sports car that was run over by the suspect, 41-year-old Patrick Nelson, and his girlfriend, before they rammed Weber’s SUV. Poston said he and Weber saw Nelson dive under the dash, after the crash, as if he was going to grab a weapon. Weber, knowing he was badly hurt, and believing both his and his partner’s lives were in jeopardy, responded to the threat. Weber fired rounds from his pistol through the windshield of his own wrecked SUV and into the suspect’s vehicle, striking Nelson. Poston was not seriously injured in the collision. Both he and Weber were able to get out of their cars and help arrest Nelson and his girlfriend. "This is the work we do," said Poston. "It’s not typical in the sense that it happens every day... but when you target the worst of the worst, some people don’t want to give up." While recovering from his injuries, Weber was still as involved with his team’s work as he could be, getting intelligence to field officers and conducting other background research. "We still had the same amount of referrals and the same amount of work was coming in," said Weber. "It was hard seeing the extra load being placed on the team and not being able to help directly." Weber says he’s glad to be back on the streets. He notes that it’s more than just a job for him. He’s helping keep the people around him safe. "We live in the communities we work in," he said. "It would be hard for me not to act where I see I can do some measure of good for those around me. It is nice to have a job where the expectation is that you pursue the people doing the worst known things to other people. I don’t know how much time I’ve got so it is nice to be back at it."